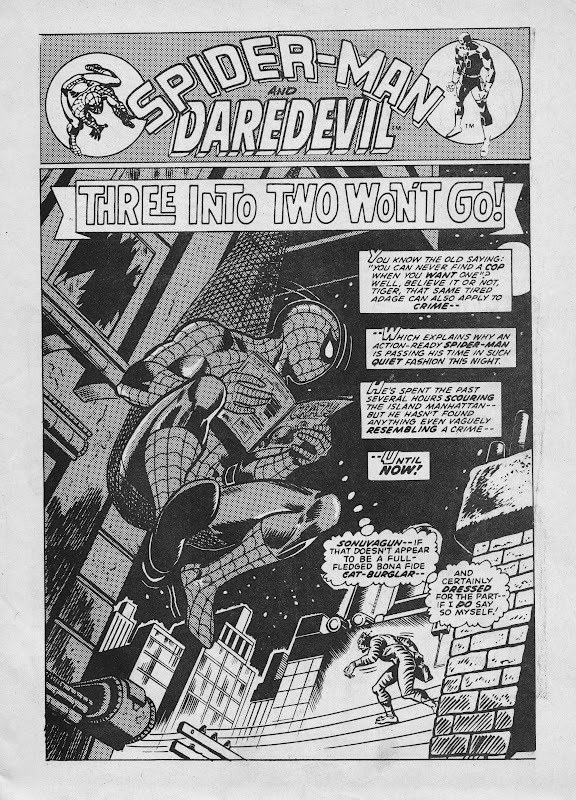 1980 was a good time to be Spider-man in the UK. Not only was his 1973-launched weekly still going strong, it was also joined by the monthly SPIDER-MAN POCKET BOOK digest AND this short-lived weekly (as well as specials and annuals). 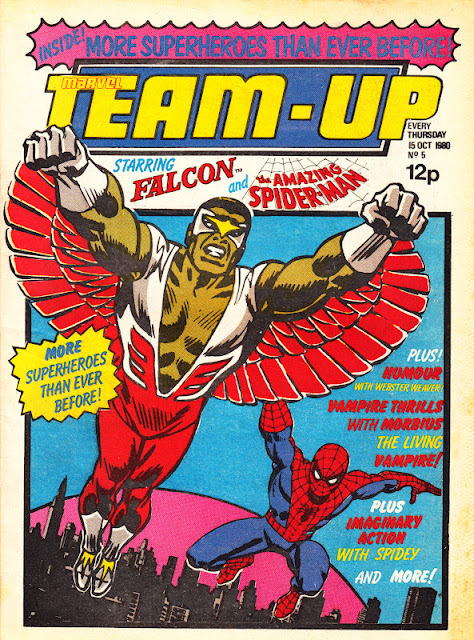 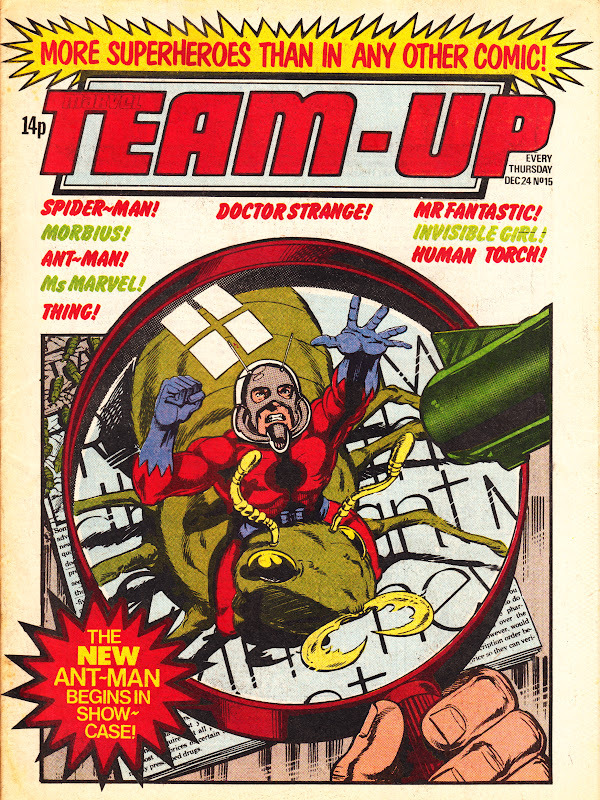 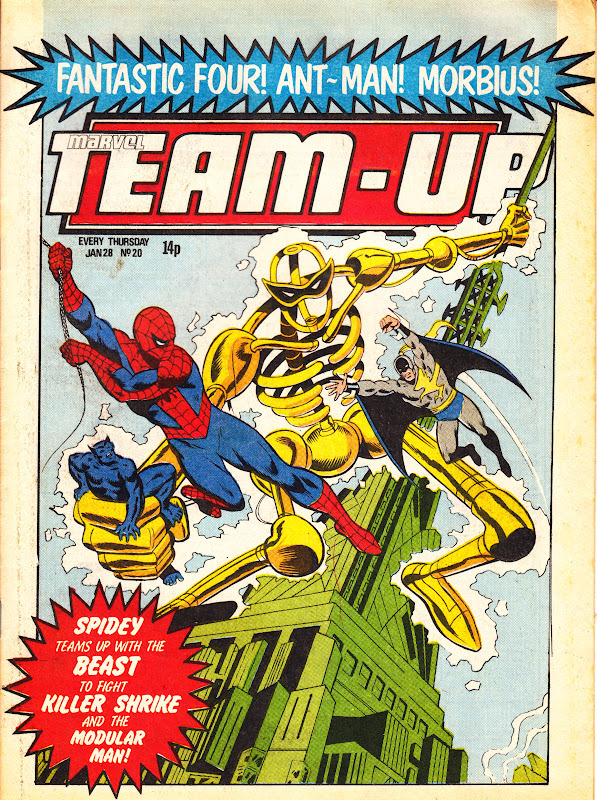 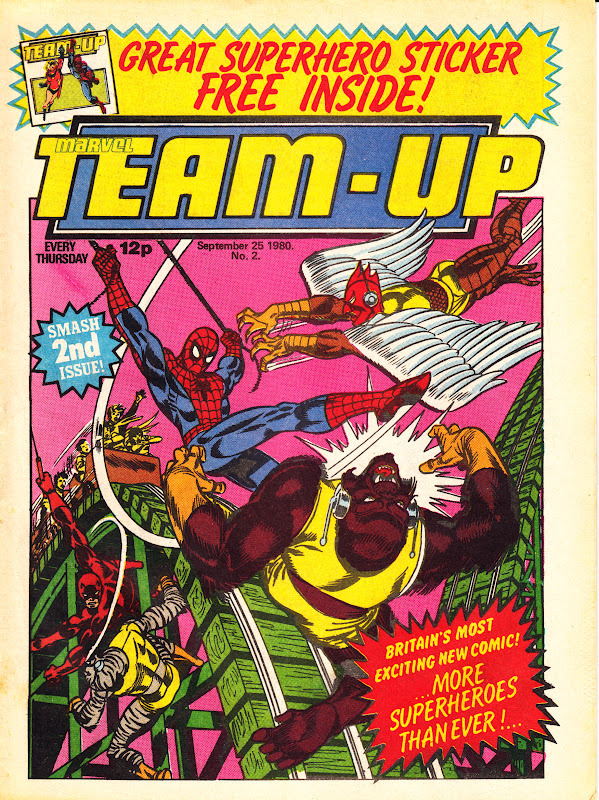 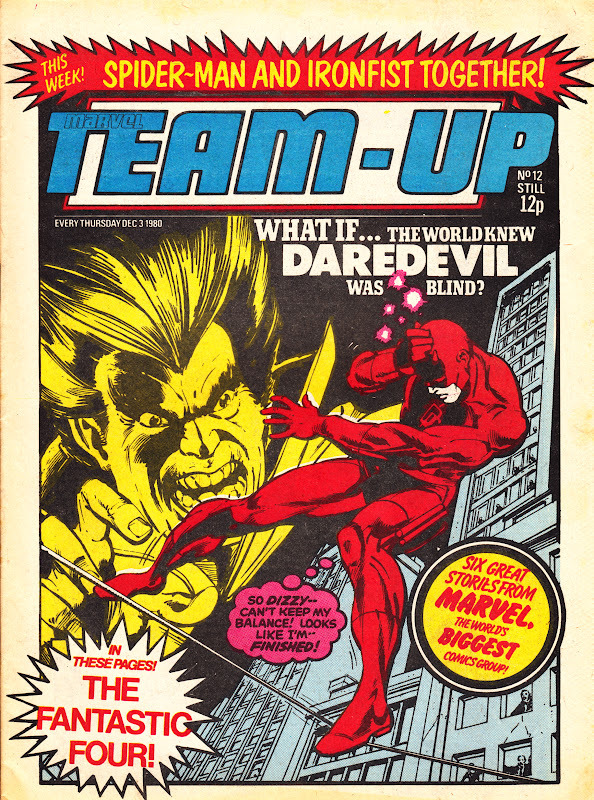 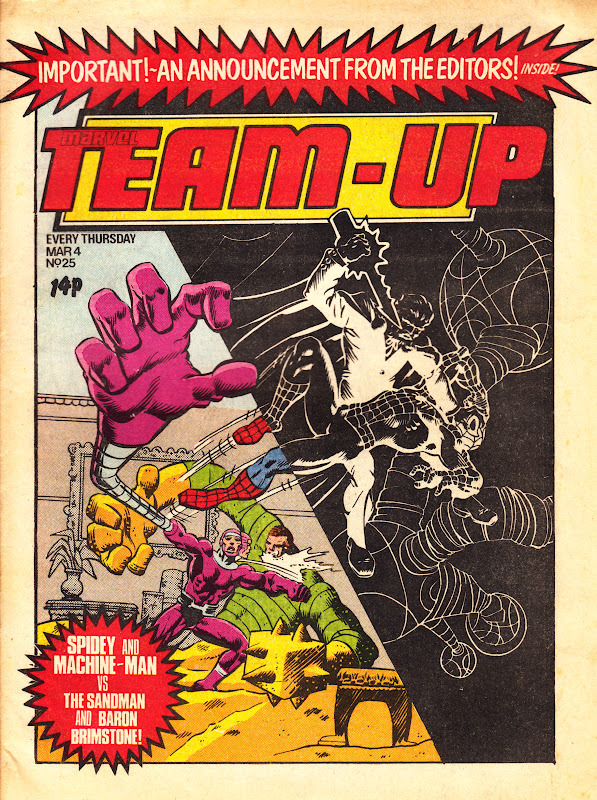 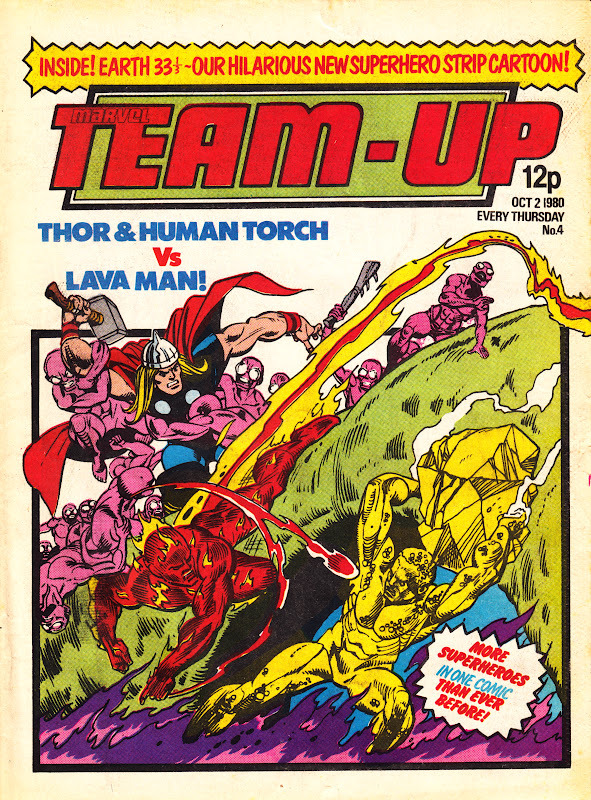 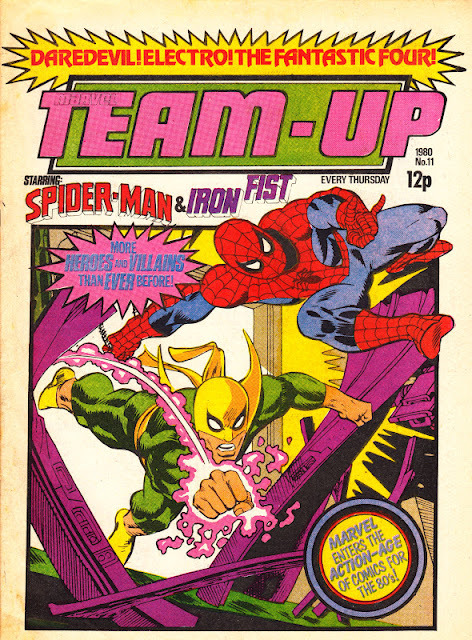 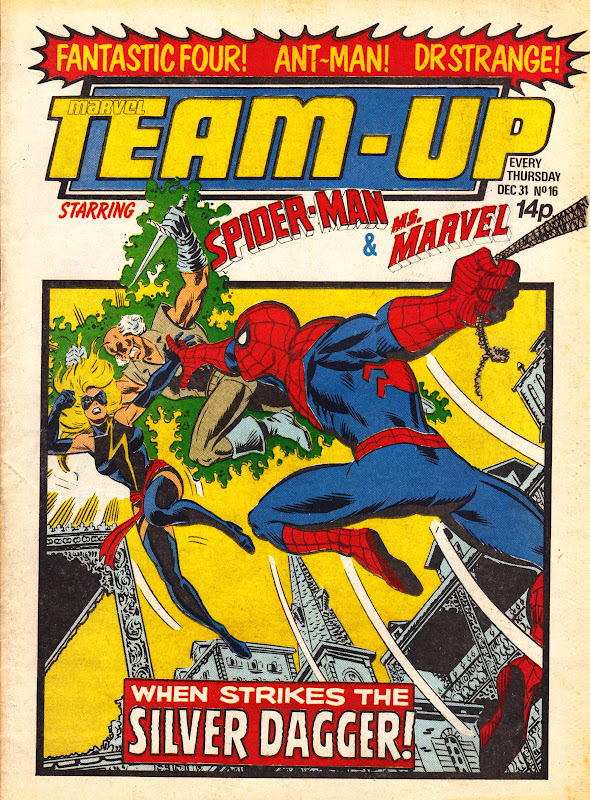 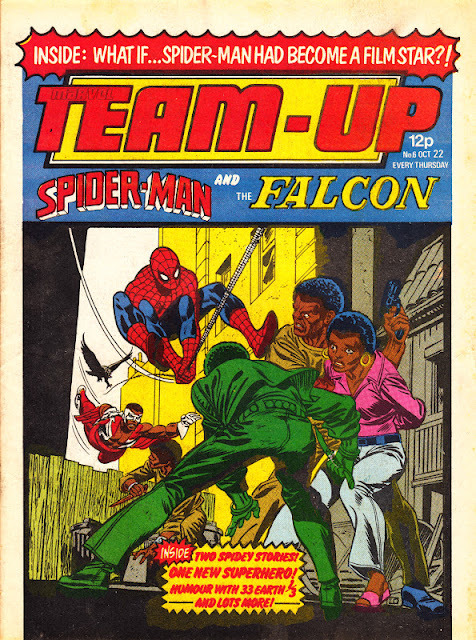 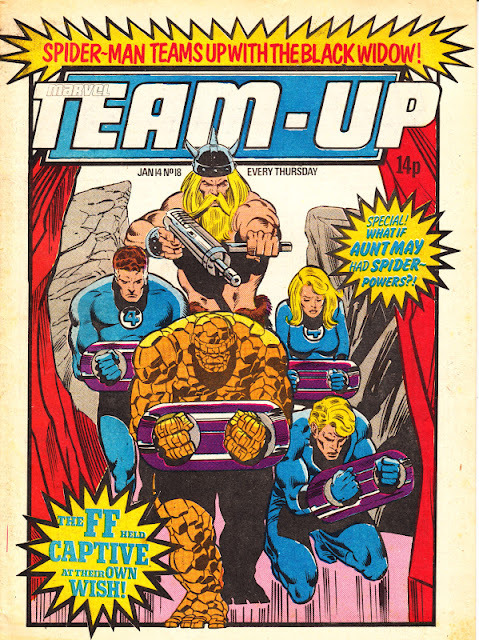 MARVEL TEAM-UP diverted the easily-accesable self-contained US TEAM-UP reprints from the Pocket Book (which itself snaffled them up from the well-established weekly) and made them the core strip in this new weekly. As Spider-man was almost always 50% of any team-up (occasionally stepping aside for The Human Torch), it ensured regular appearances. SPIDER-MAN POCKET BOOK back-tracked to the sixties, reprinting Spidey's chronological appearances beginning with US AMAZING FANTASY 15. 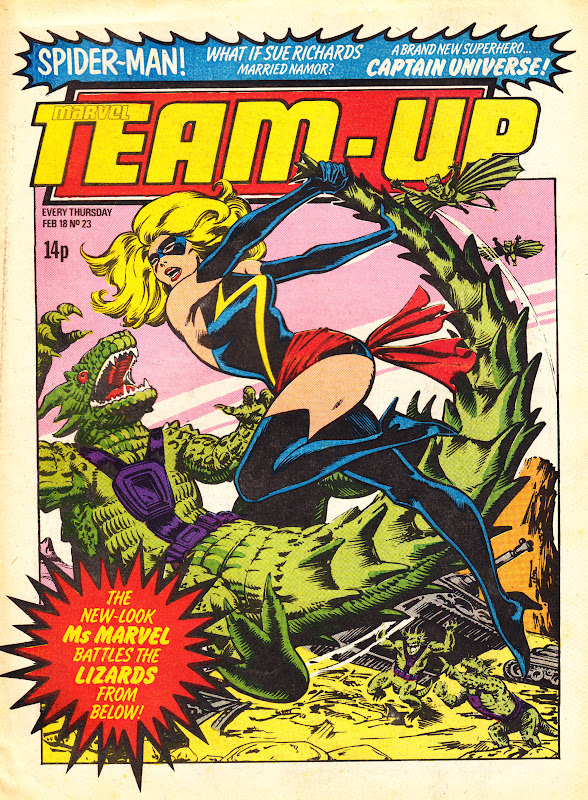 MARVEL TEAM-UP also included reprints of MS. MARVEL, MORBIUS THE LIVING VAMPIRE, THE FANTASTIC FOUR, WHAT IF and a rotating spotlight feature, beginning with JACK OF HEARTS. 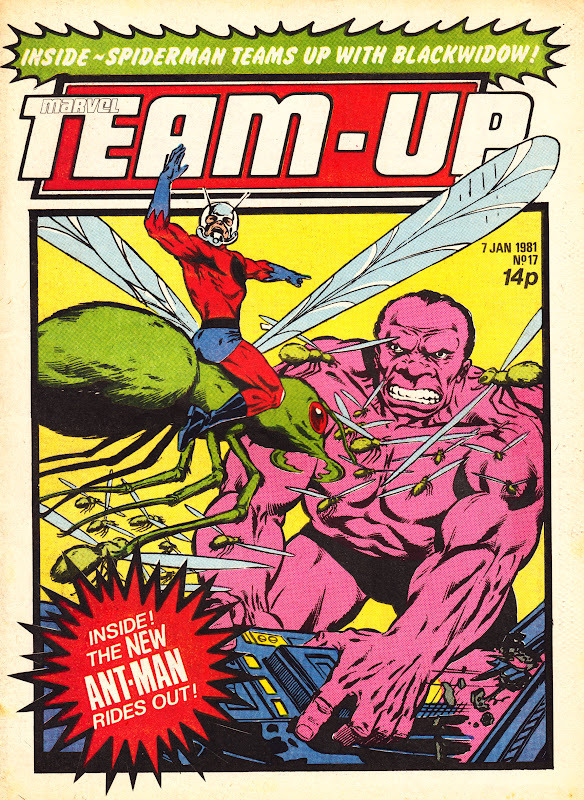 Ant Man, formally of HULK COMIC, was subsequently added to the line-up. 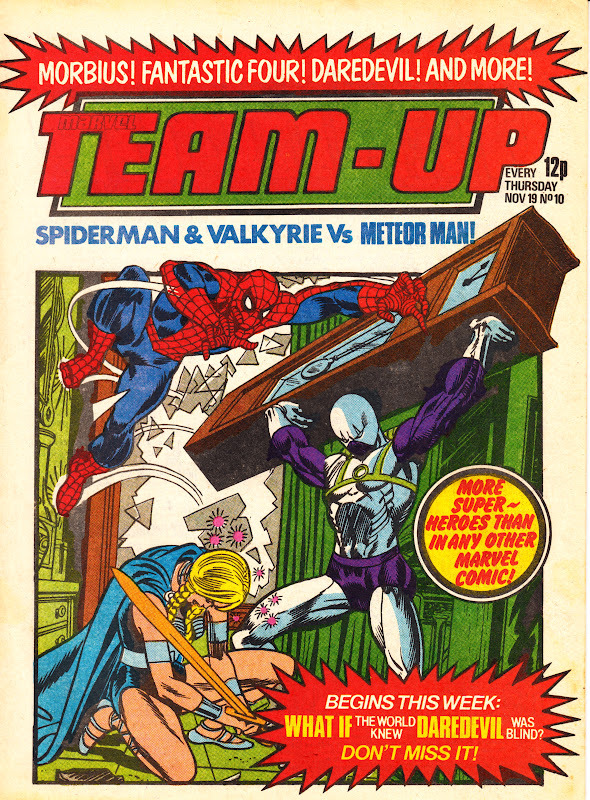 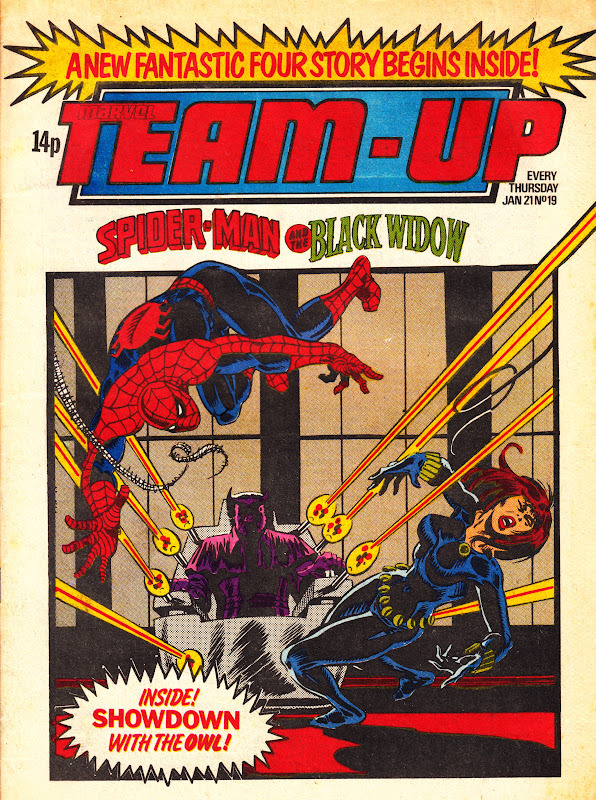 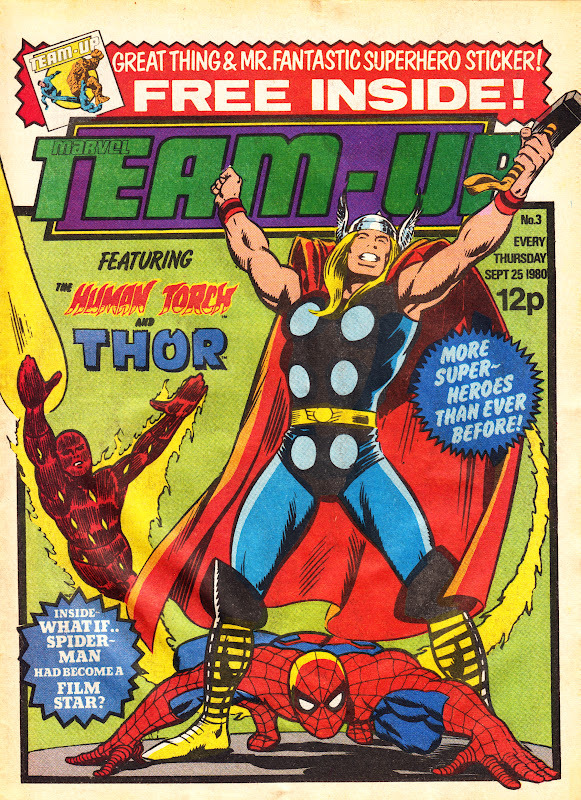 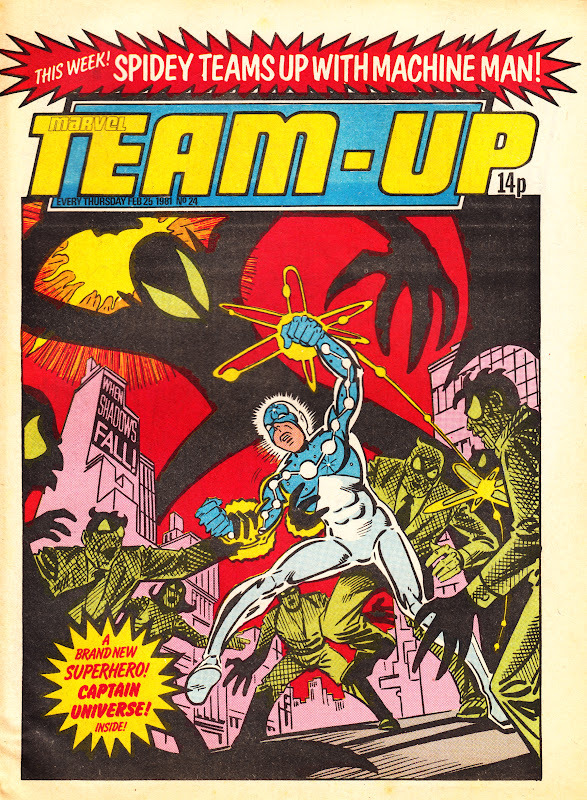 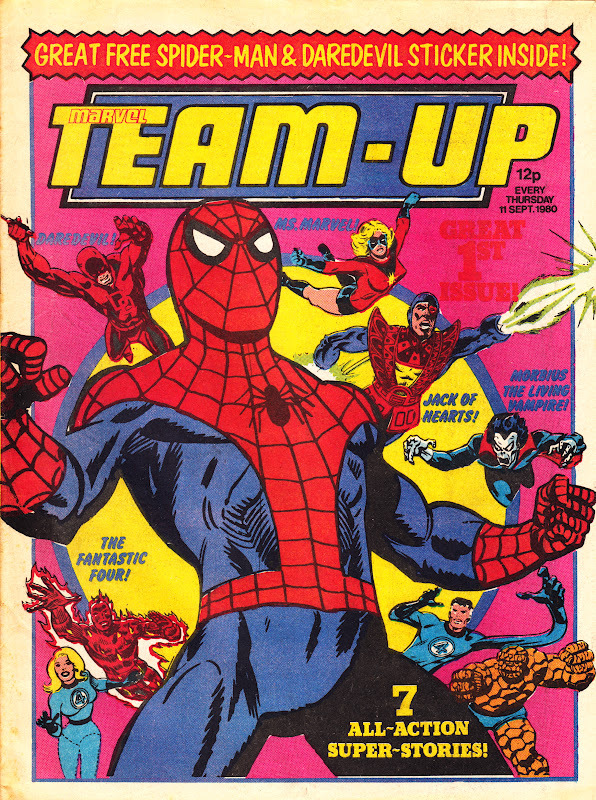 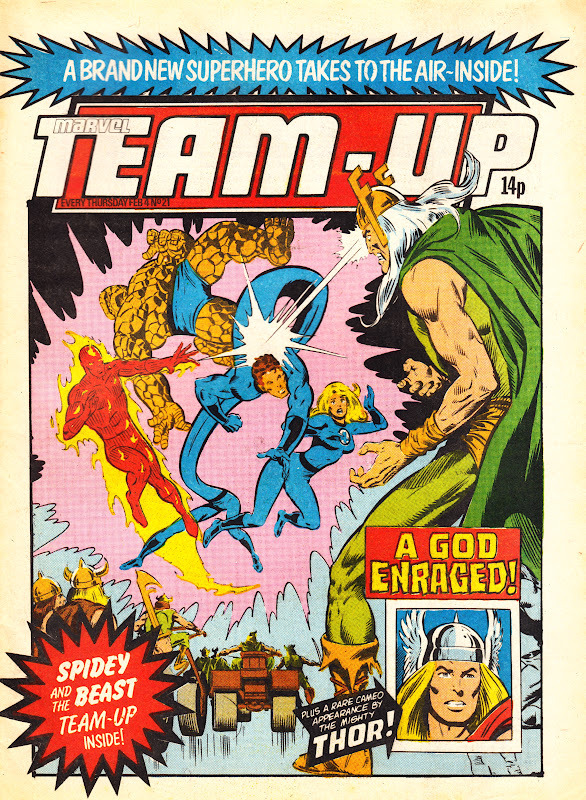 A spin-off Winter Special, MARVEL TEAM-UP WINTER SPECIAL '80 was published concurrently. 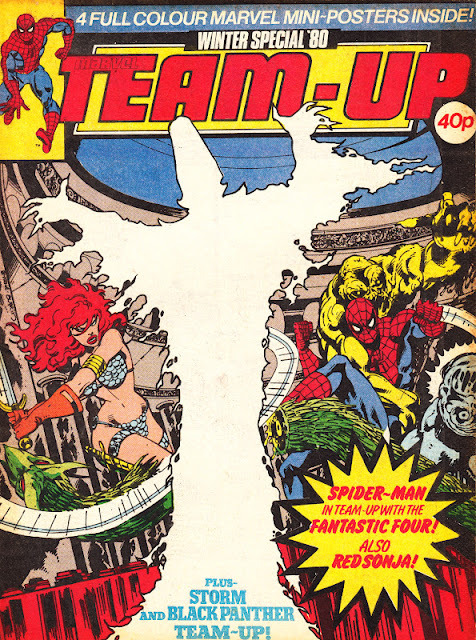 Team-Up suffered from some erratic dating, correcting cover-dates twice and issuing one edition without a date. 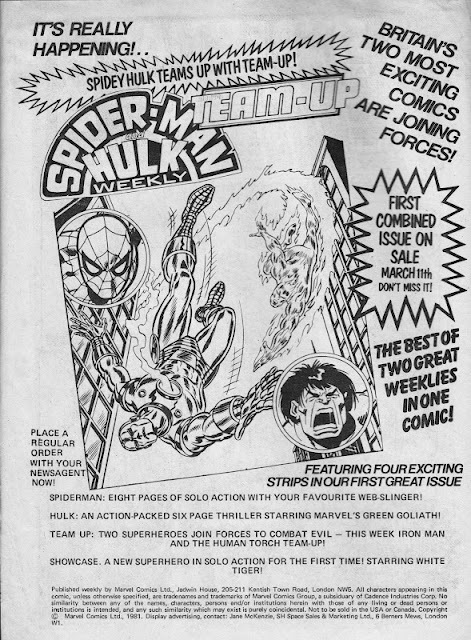 The weekly folded in March 1981, unsurprisingly folding into SPIDER-MAN AND HULK WEEKLY to become the clumsily-named SPIDER-MAN AND HULK WEEKLY INCORPORATING TEAM-UP, latterly simplified to SPIDER-MAN AND HULK TEAM-UP (even through they do nothing of the sort). 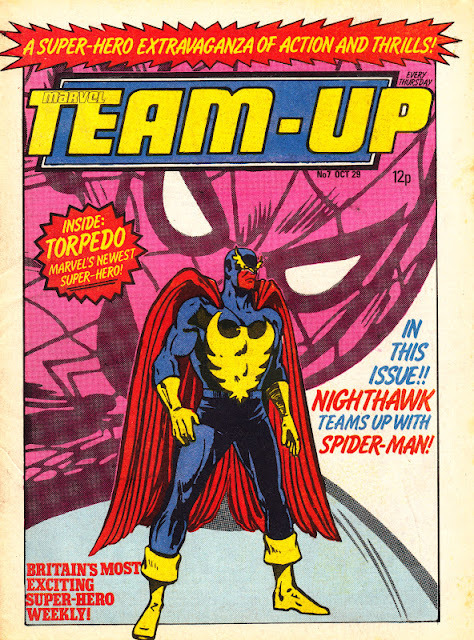 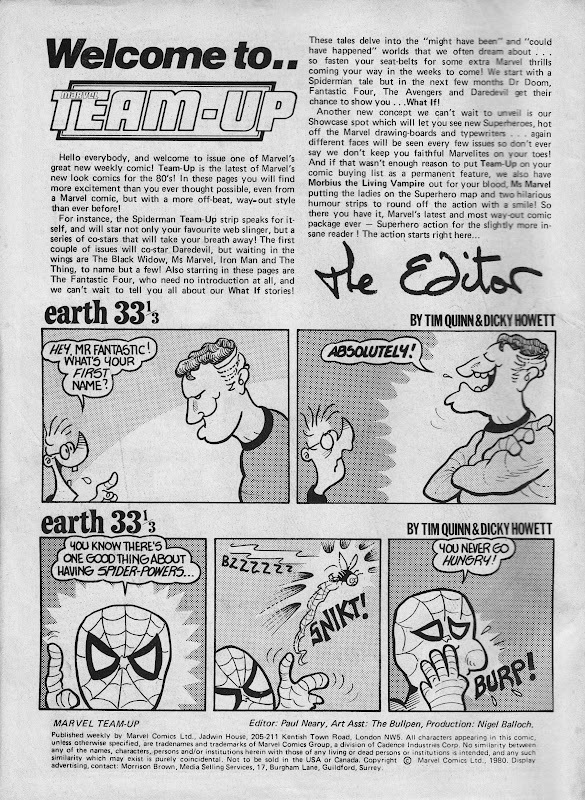 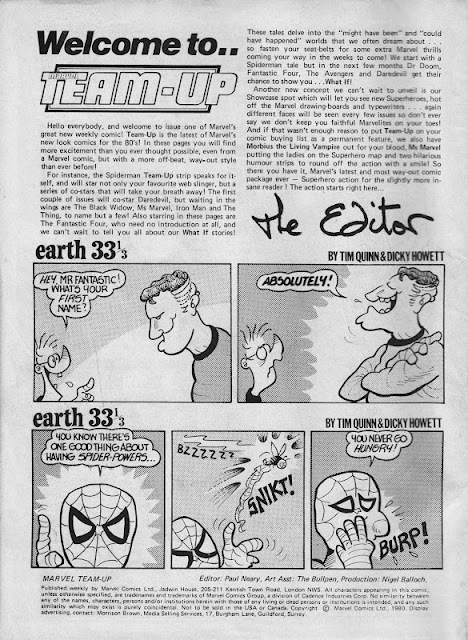 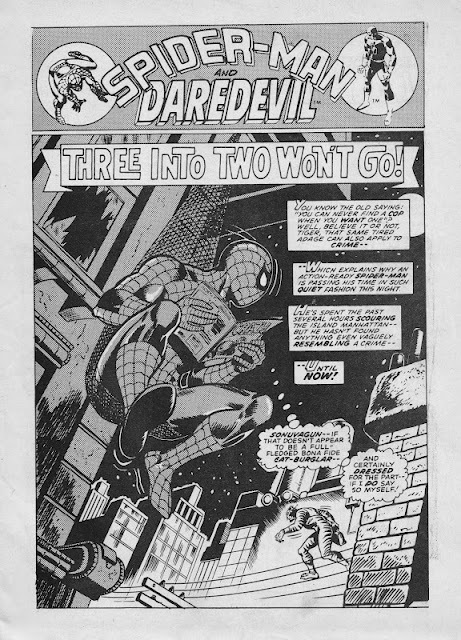 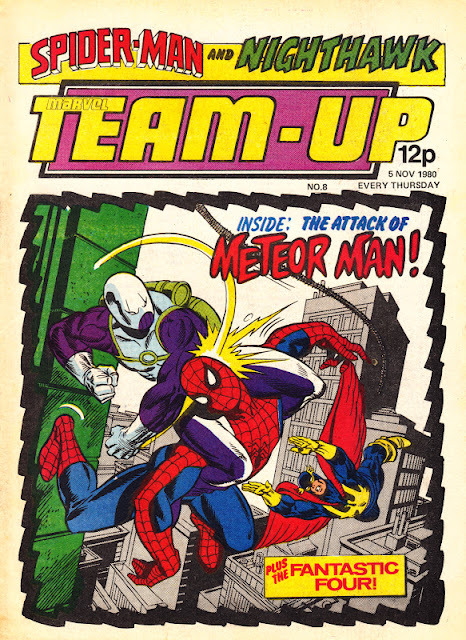 UPDATE 1-JULY-2012: According to the UK fanzine BEM (issue 29, August 1980) M T-U was originally going to be called SPIDER-MAN AND THE SUPER-HEROES, published in parallel with the existing weekly (which was currently in its SPIDER-MAN AND HULK WEEKLY incarnation). 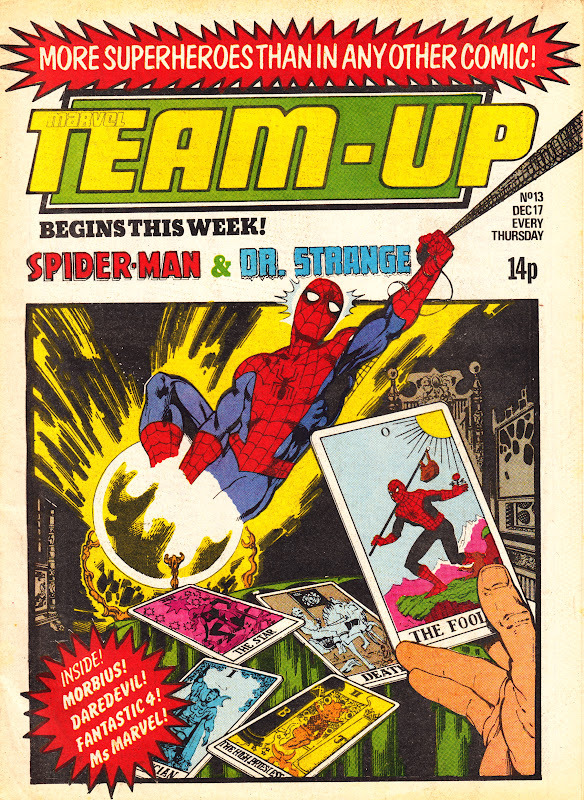 The name change was presumably the result of potential confusion between the two weeklies (and the SPIDER-MAN POCKET BOOK) and, possibly, because it was nearly identical to a previous incarnation of Spidey's weekly. 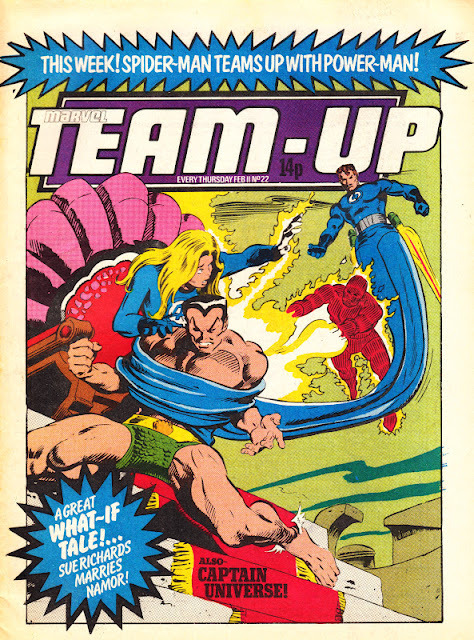 Issue 3 has the same cover date as the second, suggesting the first two issues were delayed for a week and the dates were altered from issue 3 to reflect reality. The Human Torch, rather than Spider-man, appeared in the main Team-Up strip BUT the Web Slinger appeared in the What If story instead. 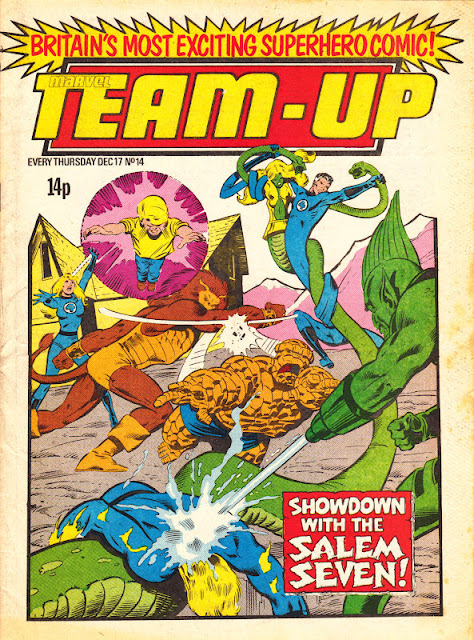 The cover-dates again go askew with this issue, jumping from 2 October (issue 4) to 15 October (issue 5). This issue is undated but should have displayed 26 November 1980. 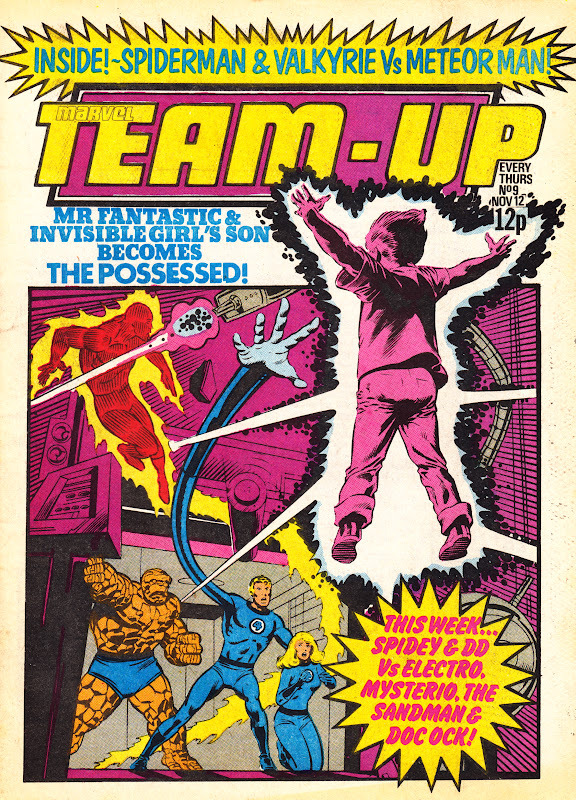 The cover states "still 12p" so, inevitably, the cover price increased by 2p the following week. 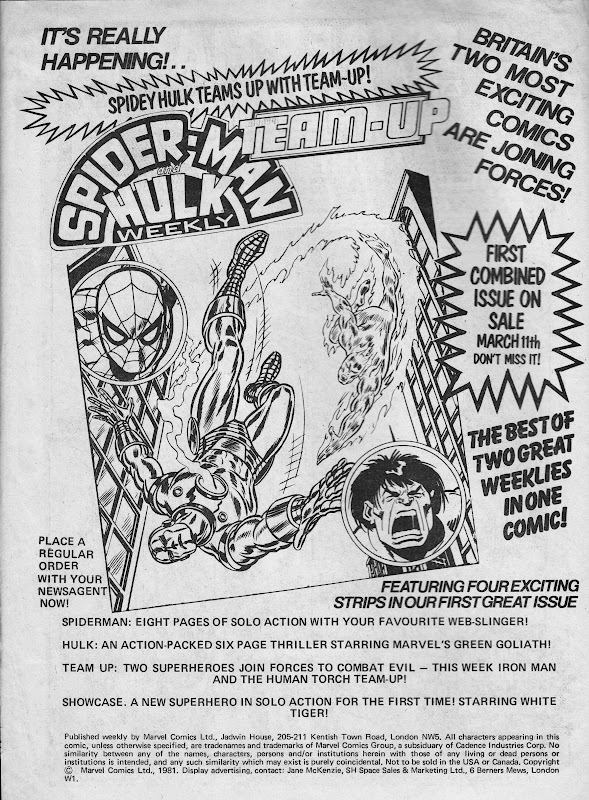 Cover price increases to 14p.